This cottage has it all! Private pool, hot tub, internet access, bikes, beach cart, and more, all in quiet Seacrest Village. No public access to this street so beach (only 275 yards away with no roads to cross) is very private. Enjoy the panoramic view of the ocean from the roof top deck or a relaxing game of cards on the screened porch. Escape from the heat with a dip in your private pool surrounded by live oaks or hangout on the pool deck under the shade of the pergola. Feel like catching dinner? Clean your catch on the fish cleaning station. 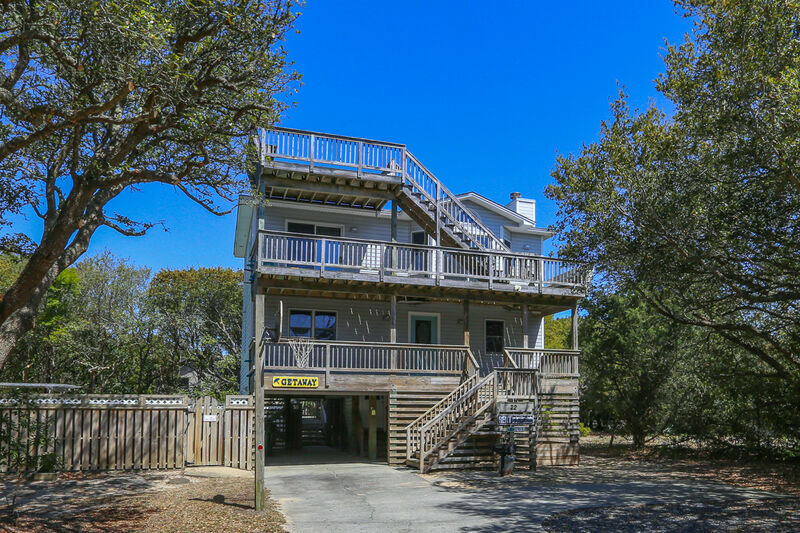 Centrally located between Corolla and Nags Head this cottage gives you many day trip opportunities and twenty minute access to eight excellent golf courses. 3 bedrooms (master bedroom with Queen, CATV, DVD player, bath with shower; 1 with Queen, CATV, DVD player; 2 Bunk sets, TV with DVD player, video games; shared full bath with tub and shower); laundry room. Master bedroom (with King, CATV, DVD player, bath with Jacuzzi tub and shower), shared powder room. Living/dining/kitchen with vaulted juniper ceiling, CATV, Blu-ray, home theater sound system.